My tolerance for junk theology and philosophy is very low. Though I have seen many quality self-help books based on sound principles, there are just as many bogus get rich quick scams disguised as self-help. One need only Google prosperity gospel or law of attraction and you'll find the foundation of junk theology and philosophy. Sadly, you will also find a multitude of mindless followers as well. When the self-help relies on exploitation to bolster its message, it descends into the obscene realm. 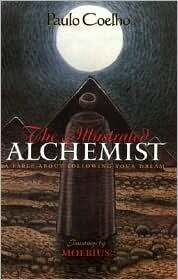 Paulo Coelho's The Illustrated Alchemist uses negative stereotypes of women and racist depictions of Romani people to lift up the main character's voyage to discover his personal legend. It's the same tired portrayal of Gypsies being thieves and only showing women as weak, passive characters. Coelho's choice to do this negates any possible benefits to the reader. It also stops me from discussing the story any further. I have no time for looking past racism and sexism to find golden nuggets. This book is supposed to be an inspirational piece for people to follow their dreams. While that is important, this book takes it a step too far by romanticizing that journey as something completely necessary to do regardless of one's circumstances or the effects of that journey on other people. It is quite irresponsible and unrealistic. For authentic and truly inspirational reading, I recommend Eckhart Tolle or Parker Palmer. These thinkers do not rely on racist and sexist portrayals to lift up their message. Of course they demand reciprocal thinking on the reader’s part, something that might be lost with Alchemist apologists. Ugh, I hated The Alchemist! I stopped reading this piece of trash, so it’s good to hear someone else finds it repulsive, too. Too many people think this book is fabulous and inspirational, but I agree with you completely, it’s horrible. LeAnn, you and Ben are not alone — I hated it too. In fact, Ben read my copy that I was glad to get rid of. I have a theory that this book is beloved by Hallmark Philosophers and people whose ultimate creative outlet is making scrapbooks. My stomach is starting to hurt at the thought of how many people that have adopted this as their life’s philosophy. I realized the author was a racist as well when he talked about an Arab and how the main character knew he was stronger and found these darker people ugly. Definitely a book with supposedly “positive” messages from a racist author. I am glad other people picked up on his tendencies and said something about his garbage wrapped up in a pretty package.